Our taxi driver could not find the venue – it was the Blind Club near the bus station in Belgrade. So we missed what turned out to be a great gig by a band we’d not heard of – Hashima. Our companion said the band had a great guitarist – Igor Mišković – and so our appetites were whetted only to be dashed by dark unnamed streets. The irony of a club for blind people being hard to find was not lost on us. So I’m now glad to hear what I missed. 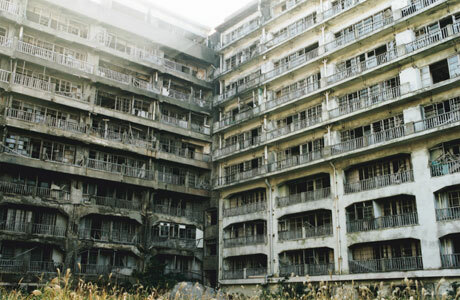 The band’s name Hashima is taken from the abandoned Japanese island Hashima, whose ghostly and decaying housing complexes (pictured above) are salutary reminders of the transience of all things manmade. The band grew out of poems inspired by the island written by Igor, the inspiration of the Belgrade Jazz Festival, the ideal of free improvisation especially within a quartet, and discussions about cinematography by Tarkovski and Resnais. The band’s backgrounds include free improv, folklore music, fim production, jazz and classical training. The result is something very beautiful, harmonious, mysterious and visual with Eastern influences that make the east stretch from Serbia to Japan, from Balkan folk to Japanese stringed instruments. There is a dreamlike quality to the easy and equal interaction of the band members. There is a delight in sounds – perhaps that sounds odd – but the landscape created sometimes has elements of noise abutting a delicate and serene and rather macabre dance, if you ponder the inspiration of Hashima. The composition below, recorded at that concert, is an interpretation of a dance by Vasilije Mokranjac whose mysterious, untimely and premature death adds poignancy to this delightfully serpentine and sensuous rendition. It would be great to see them live!